Niyazi Hajibeyov, familiarly and affectionately known simply by his first name "Niyazi" (pronounced nee-YAH-zee), is recognized as Azerbaijan's greatest symphonic conductor. It was Niyazi who first promoted the opera, ballet and symphonic works of many Azerbaijani composers - Uzeyir Hajibeyov, Muslim Magomayev, Gara Garayev, Fikrat Amirov, Arif Malikov and others-in the USSR and, in some cases, even beyond. He was the first Azeri conductor to gain international recognition. Not long ago, I stopped by Niyazi's Home Museum in Baku. In Azerbaijan, we're fond of transforming the former living spaces of our great cultural heroes into national "home museums." And so it is with Niyazi, whose museum was opened on "Music Day," September 18, 1994. There is no elevator in his apartment building so I trudged up the three floors to the place I knew so well. It had been quite some time since I had been there as Niyazi had passed away 13 years ago. I had barely entered the hallway when memories came flooding over mememories of those unforgettable evenings that so many of us had shared with him in his home. Slowly, I wandered through the familiar five-rooms. How modest everything looked-so spartan. But, it had always been that way. There was nothing expensive on display-no china, no crystal or silver. The only objects of value were the scores of photos gracing the walls, many of them inscribed to Niyazi, showing him posing with other musicians. As I continued wandering through the apartment, a couple of times I had this strange feeling that one of the doors might suddenly open and Hajar Khanum, Niyazi's wife, would burst in, announcing, "Hey, Prince! Look who's here!" Of course, she too has passed on [October 1990], but I rather enjoyed imagining what it would be like if she really would have appeared. Of course, she no longer would have been young, but, no doubt, her smiling eyes and aura of graciousness would be the same as always. I could imagine Niyazi following after her, his hands clutching a musical score. And then Hajar Khanum would busy herself setting the table and spreading an array of food for the unexpected guests. Yes, that's exactly how it used to be in Niyazi's home. Wherever they lived - Moscow, Istanbul or Baku-they always had guests who stayed with them late into the night. In fact, one time I asked Niyazi if they had ever spent an evening home alone. My question seemed to offend him. "Thank God, No!" he replied. "How could we live without friends?" 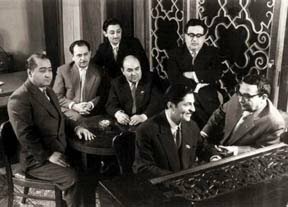 Left: Azeri composers with Niyazi: clockwise, starting from the left: Jahangir Jahangirov, Tofig Guliyev, Azer Rezayev, Sayid Rustamov, Soltan Hajibeyov, Gara Garayev and Niyazi (1960). Courtesy of National Photo Archives. 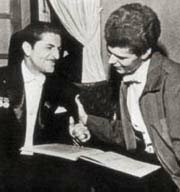 Right: Niyazi with Van Cliburn who had performed in Baku. Niyazi had conducted the orchestra (July 24, 1960). As I gazed at one of the photos of Hajar Khanum and Niyazi, it seemed as if she wanted to speak. I let myself slip into an imaginary conversation with her. I guess, in a sense, such reminiscence helps ease some of the grief of having lost these dear friends. In my imagination, I asked her how Niyazi had gotten involved with music. It was almost as if I heard her voice reply. It seemed she was eager to speak, as it had been so long since we had seen each other. She told me how his career had unfolded. And his uncle was none other than the great composer and founder of Azerbaijan's classical movement, Uzeyir Hajibeyov (1885-1948). The professional music school that he founded still stands today as the highest pedagogical musical institute (the Academy of Music). It was Uzeyir who introduced Niyazi to Azerbaijani folk music and to the Western opera and symphonic works that the youth learned to play on the piano and violin. Niyazi was propelled into the musical limelight by an experience in Moscow in 1938. It was during the height of Stalin's repression, when one of the propaganda tools of the regime was to project an image that all ethnic groups living in the Soviet Union were getting along just fine as one big happy family. The Soviet government held what they called "The Ten Year Festival of Azerbaijani Arts." That year, Azerbaijanis planned to perform Uzeyir Hajibeyov's operas, "Koroglu" (The Blind Man's Son, composed in 1934), "Arshin Mal Alan" (The Cloth Peddler, 1913), as well as Muslim Magomayev's opera "Nargiz" (1935). It so happened that Uzeyir, who was supposed to conduct these works, fell ill and called upon Niyazi to step in for him. Niyazi was young at the time-only 26 years old. And, as Hajar Khanum tells the story, he was terrified. Never had he conducted such important works in front of such an audience. The event took place in Moscow's most esteemed concert hall, the Bolshoi Theater. Despite intense pressure, Niyazi successfully conducted all three operas and, in the process, stole the hearts of many music lovers that night. It turned out to be the beginning of a brilliant career." Hajar Khanum didn't seem to want to stop her narrative. She seemed lonely. I was eager for her to continue. I had missed hearing her voice these last few years. She began again. "Niyazi had this incredible charisma that made people fall in love with him. Audiences were mesmerized with his sense of rhythm, the fluidity of his music and his great passion. While conducting, he rarely glanced at the musical score because he knew the pieces so well." Hajar Khanum recalled how Niyazi used to turn and bow to the audience after finishing a piece and how, after flipping back the long locks of hair that had fallen over his face, he would acknowledge his colleagues. When Niyazi was conducting, she never applauded him openly. "His eyes used to search the audience until they found me, and he was very satisfied when he saw me sitting proud and quiet." "But," she insisted, "Niyazi wasn't only a conductor though musicologists rarely mention other aspects of his creative work. They neglect to mention that he was a prolific composer as well. For example, he wrote the opera "Khosro and Shirin" (begun in 1940). His lyrical ballet "Chitra" (1971), based on an Indian motif, won the international Nehru Prize (named after India's first prime minister) in 1974. Niyazi was also involved in writing about 25 film scores, including the very first film in Azerbaijan with sound, "Almas." Among his symphonic works, his favorite was the mugam "Rast" (1956). Niyazi's incredible ability as a conductor was innate. He was fond of telling the story of how once when he was practicing with an orchestra abroad, the musicians played the score a tone lower than the designated key. Such subtlety would be difficult for most musicians to detect. But Niyazi was very familiar with the work and didn't fall for their trick. At the conclusion of the piece, Niyazi thanked the musicians. But when they started to leave, he called them back and announced that rehearsal wasn't over yet. "This time we'll play it as it was intended by the composer," he told them. The musicians were shocked. Niyazi had called their bluff, and in the process, earned their respect. Niyazi's repertoire was not confined to Azeri composers. He also used to perform many of the world's classics as well as conduct world-famous orchestras. For example, he conducted with outstanding musicians such as Sviatoslav Richter, (Russian pianist, 1915-), Heinrich Neuhaus (Russian pianist, 1888-1964), David Oistrakh (Russian violinist, 1908-1974) and Mstislav Rostropovich (cellist who was born in Baku in 1927). Niyazi's friends included many other great musicians like Evgeny Svetlanov (prominent conductor and composer (1928-), Dmitri Shostakovich (pre-eminent Russian composer, 1906-1975) and Dmitri Kabalevski (noted Russian composer, 1904-1987)." I realized that I had stopped listening. Hajar Khanum must have recognized it, too, for there was a great silence. I was anxious for her to continue, so I asked her about an incident with Hajibeyov in 1945 when Niyazi was involved in arranging the score for the movie version of Hajibeyov's musical comedy, "Arshin Mal Alan" (Cloth Peddler, 1913). She was happy to oblige. "You know," she continued, "when they were getting ready to shoot the movie in 1943, Niyazi was commissioned to modify the musical score. Naturally, cinema as a genre has its own specific features that are quite different than those of the opera for which the music was originally written. Niyazi set to work to adapt it for the screen. In the meantime some people started telling Uzeyir, 'It's terrible what Niyazi is doing to your music. He's spoiling it even while you're still alive!'" "Well, the day for the film premiere finally arrived. That evening before we went to the theater, Niyazi told me, `Hajar, if people start saying awful things about the music during the movie, I won't be able to stand it!'" "Uzeyir came to the premiere with his wife Malika Khanum. We saw them both watching and listening very intently. When the movie was finished and the lights came back up, Uzeyir came over to us. He hugged and kissed Niyazi and said, `My lion! You're so brave! Thank you so much. Everything was just great. Thank you very much!' Those were his words, and my husband cherished them as a great gift." Niyazi was an earnest advocate of nearly all of the famous opera and symphonic works of Azerbaijani composers. Shostakovich once said, "We can strongly affirm that one of the musicians to whom Azerbaijani composers should be most thankful was the talented conductor and composer Niyazi." On my way out of the museum, it seemed as if the eyes in a photo of Niyazi and Hajar Khanum were quietly reproaching me. "Are you going away again and leaving us alone? You know that we're not used to being without friends." I paused to give one last glance all around-there was a respectful silence. But it was a silence that belongs to museums, not to the home of the vibrant Niyazi and his wife. I returned home and sat at my desk, recollecting the memories from my visit to the museum. This was one of the few times in my journalistic career that I could write without referring to notes. The ideas flowed from my memory, triggered by the photos that had touched such deep feelings inside of me. Niyazi had an inexplicable magnetism that attracted, talented people. Maybe it was his intensity. Soviet musicologist Janna Dozercheva once stated that, "In concerts, Niyazi was literally burning from passion. Each of his performances was a great act of self-immolation." I think she was right. With each concert, he seemed to consume himself, even to the extent of losing part of his life. During concert intermissions, many times I used to see his wife giving him dry clothes to change into, helping him as if he were a little child. Then they would flash each other a knowing smile and soon he would be back on the stage again. I also remembered how Hajar Khanum was always able to gently and tactfully smooth over the sharp edges of Niyazi's personality. Having a difficult character, I suppose, is quite the norm for talented people. As I sit writing these lines on a November evening, something very strange has happened. On Channel 2 of our national television, a concert is airing which features Niyazi conducting his own mugam "Rast." I swear that this is not journalistic invention. Perhaps, it was the kind spirits who arranged this treat just for me. As I sit glued to the television set, a deep pleasure envelops me as I watch this great Maestro creating music with his powerful hands. His power was not a myth. It's impossible not to admire his great artistry. It's true that he was short in stature, but when he stepped onto the conductor's stand and took command of the orchestra, no one could doubt how much he towered over others. I'm reminded of how many musical giants we lost at about the same time in Azerbaijan: composers like Gara Garayev (1919-1982) and Fikrat Amirov (1922-1982), the tenor Rashid Behbudov (1915-1988) and, of course, Maestro Niyazi (1912-1982). These losses can never be replaced in our cultural history. People say that there is no such thing as an irreplaceable person, but I don't believe that. Talent is a separate issue. Obviously, there will be more talents in history, but they will not be quite the same. These giants can never be replaced, and Niyazi figures as one of the greatest among them. Azad Sharifov is head of the Journalism Department of the Higher Diplomacy College of Azerbaijan. Shirin Malikova also contributed to this article. Note: the imaginary conversation between the author and Niyazi's wife, Hajar Khanum, is based on her published memoir, "Maestro Niyazi" (1987). The Niyazi Home Museum is open to the public and is located across from the Nizami Cinema Theater at Bul-bul Prospect 21, Apt. 24. Director: Hijran Sadigzade. Tel: (99-412) 93-18-36.